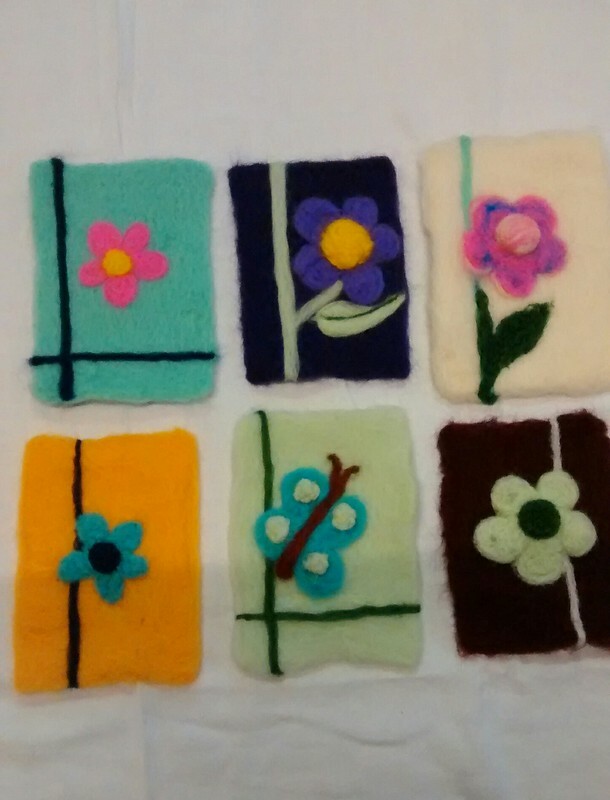 So, when my friend told me that she was thinking of running a ‘learn to felt’ workshop, I was very excited. 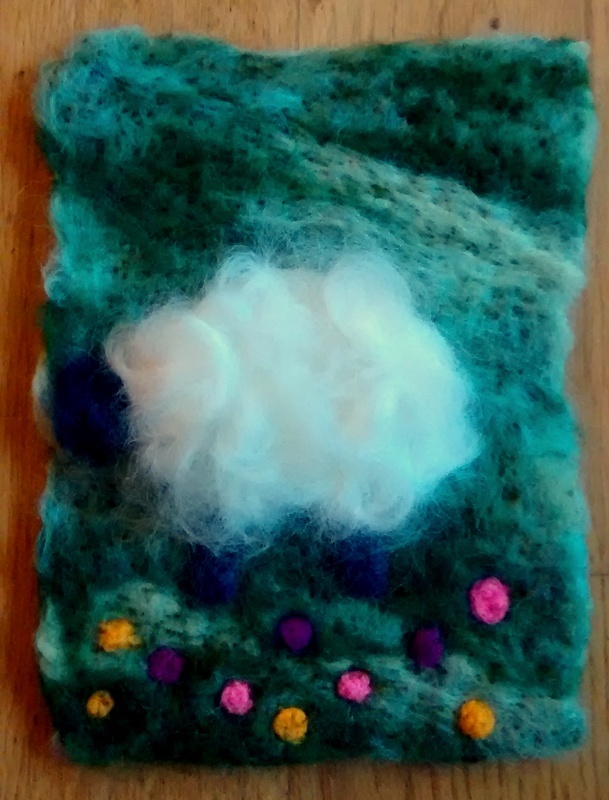 I’ve always loved and admired the things that she makes and having the chance to learn a new craft was very tempting (you know how I love all things woolly). I signed up and a couple of weeks ago, spent a very nice Saturday afternoon, relaxing and learning how to create felt pictures. 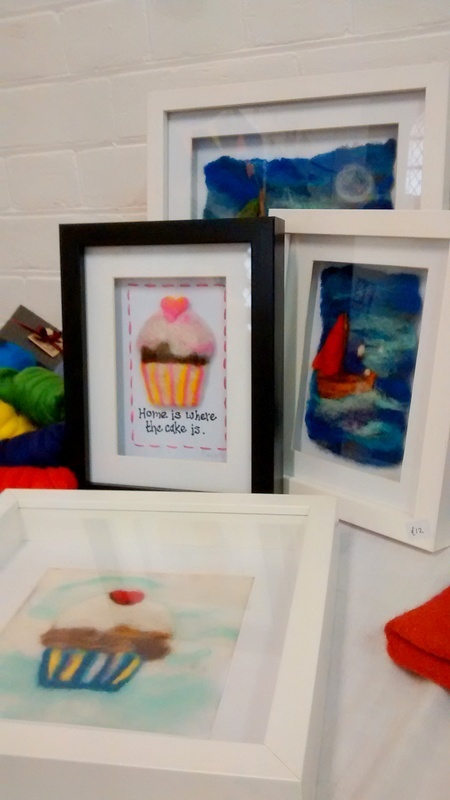 These are some of the things Pippa makes…..aren’t they beautiful? You can see why I was so keen to learn! When we walked into the room there was a large table full of the things she’d made as well as magazines and books full of things to inspire us. I love the person in the boat. 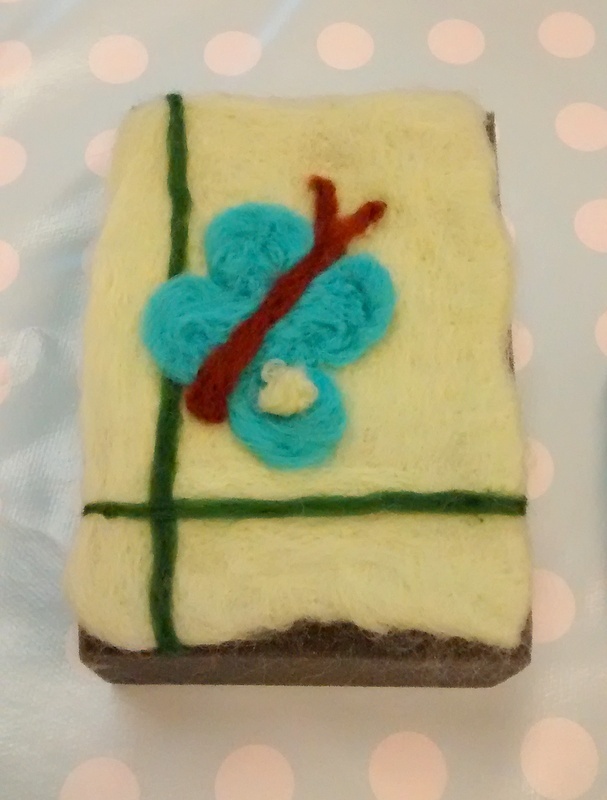 As someone completely new to felting, the way the waves were created was fascinating. If you want to check out more of her lovely creations, pop over to her facebook page. There were also two large tables in the room for us to sit at. 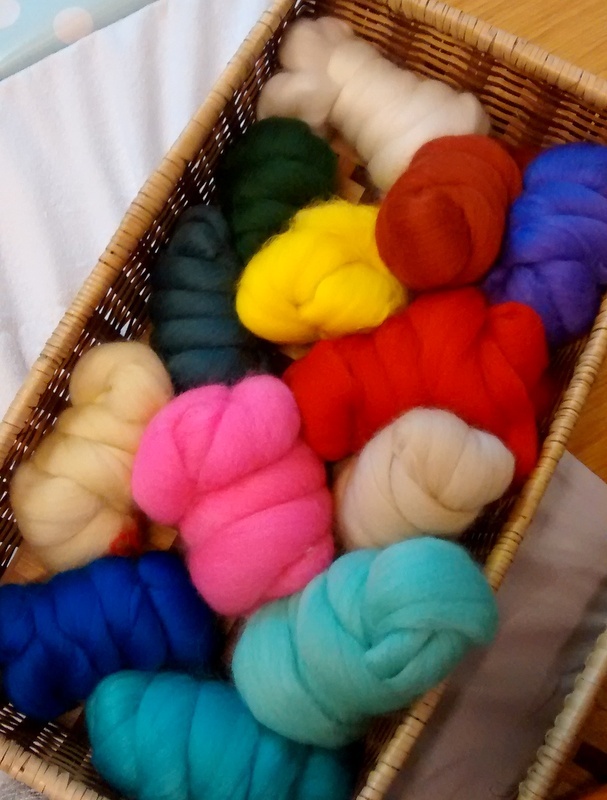 We were each given a foam pad, a felting needle and were then told to choose some wool to felt (I mean, how on earth can you choose just one colour from a basket full that looks so beautiful?!). You’ll be proud of me, I did choose just one colour. 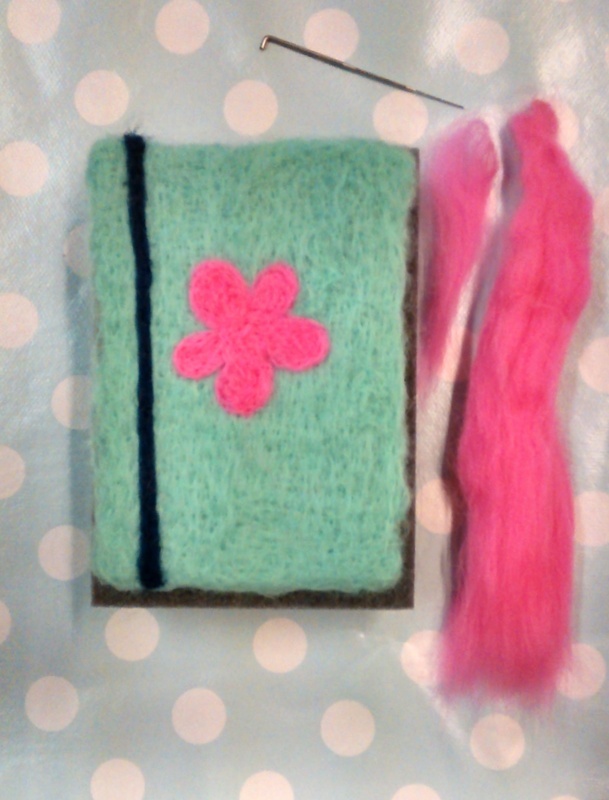 Pippa then explained all about the wool fibre and how we needed to start to create a felt base for our picture (we were going to create flower pictures). 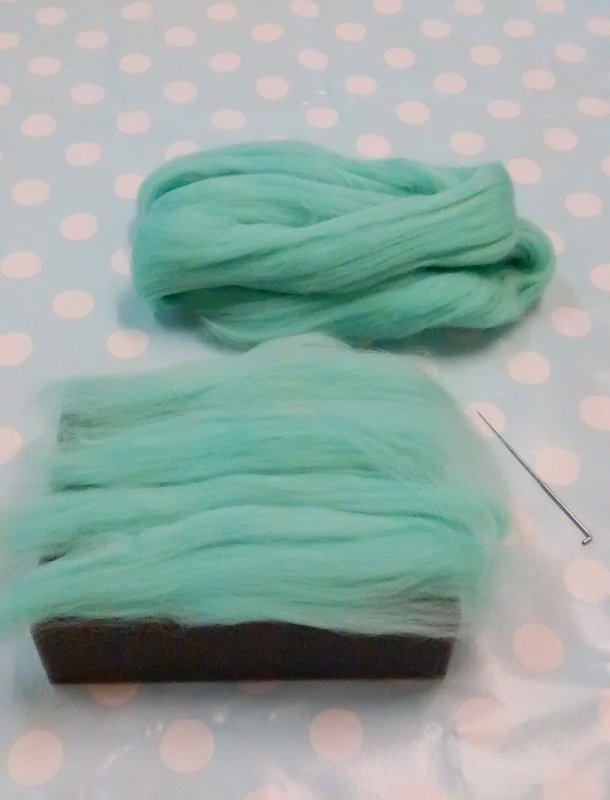 I have to admit, I was torn between wanting to felt the wool and wanting to spin it (It was so soft, and look it’s calling out to be spun!) however I persevered and did as I was instructed. A couple of layers in. 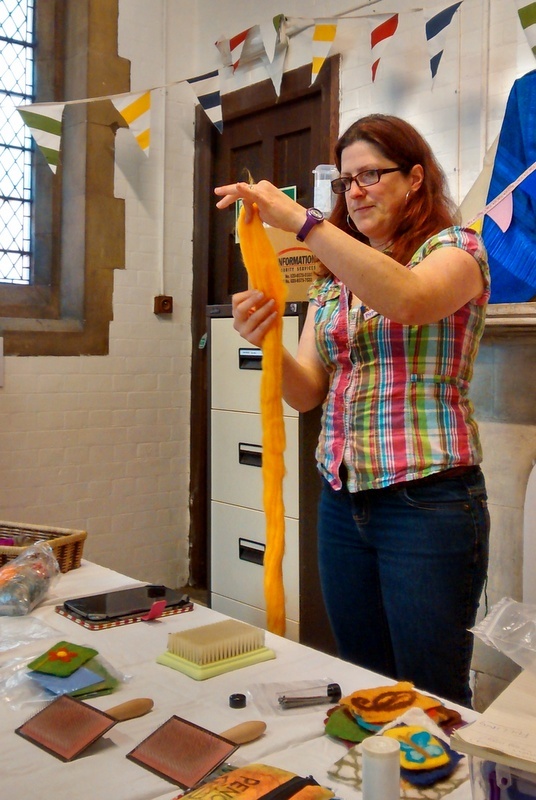 Pippa then showed us how to stab the wool correctly. 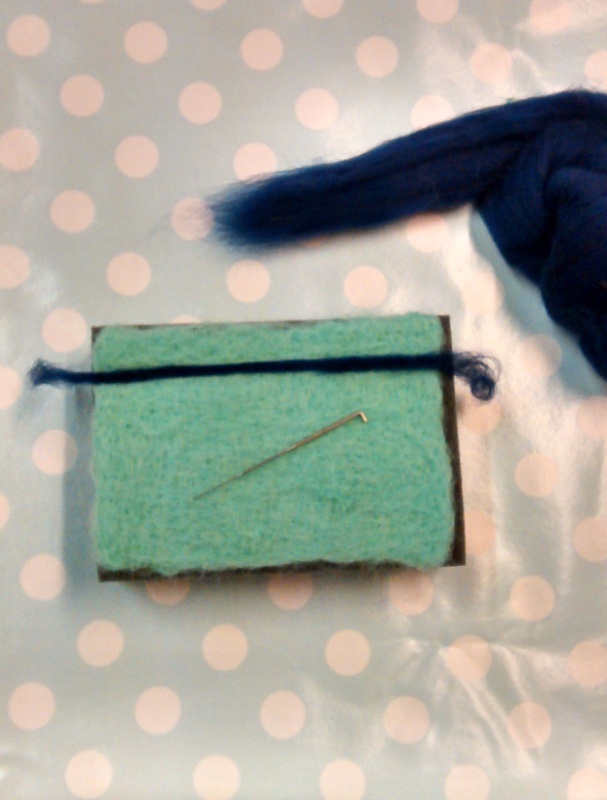 Now if you haven’t tried felting like this, I highly recommend it. It’s amazingly therapeutic! 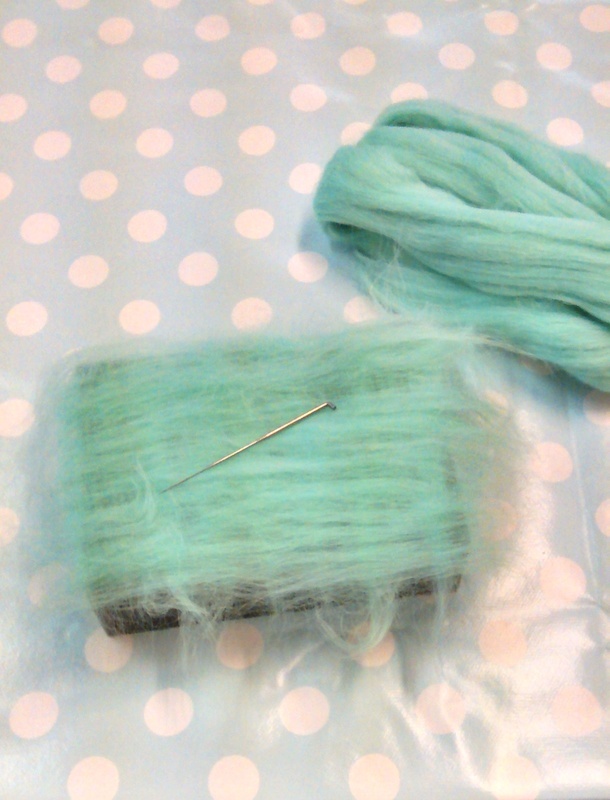 The idea is that you stab through all the layers of wool to bind them together. Basically you are allowed (and encouraged) to stab it….a lot. Here’s how mine turned out. 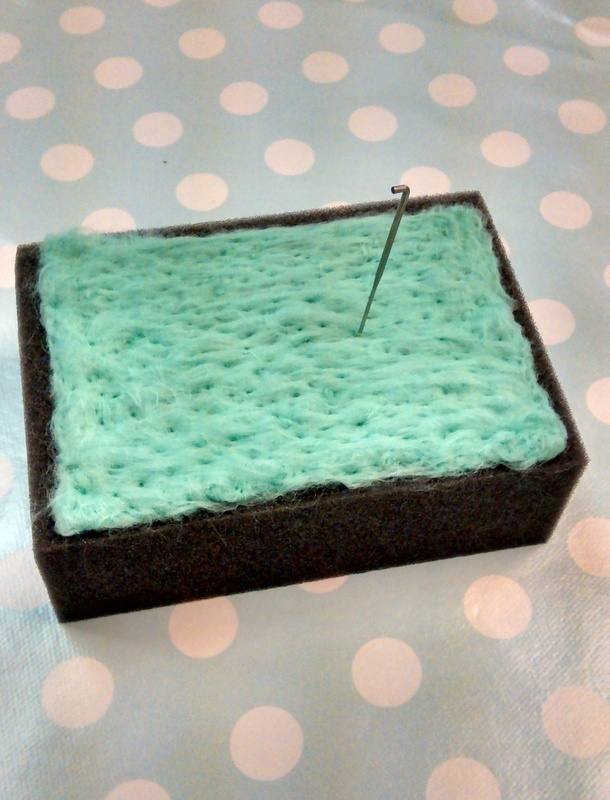 The holes do disappear a little if you rub the, now sheet of felt, between your hands gently. Next we were taught how to make a straight line (it’s not as easy as you’d think). Then onto making our flower shape. Now I’d like to stop here and say that I was impressed how good the results were. I honestly haven’t tried anything like this before, yet my flower looks like a flower and my straight line is straighter than I can draw one! That is mostly down to how clear and easy to understand Pippa made it. I know she’s my friend but I believe that part of being a friend is offering honest feedback and I was trying to stay objective. So I can honestly say I was impressed with how professional she was and how easy she made it. 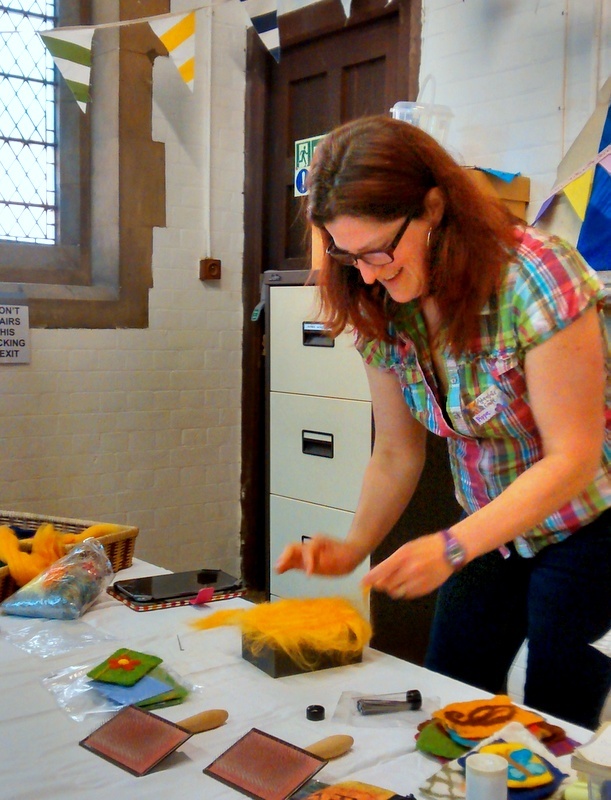 I really felt like I was sitting relaxing and was completely unaware of learning, yet came away remembering everything and being able to make my own things at home afterwards, which is a real achievement (how many times have we been to workshops where you get home, try to make something else and realise that you have no idea what to do or where to start….or is that just me?). Anyway, back to Pippa’s workshop. This is my finished piece. What I loved what how different everyone’s picture were. The other lady wasn’t happy with the flower she’d made so made it into a butterfly instead. 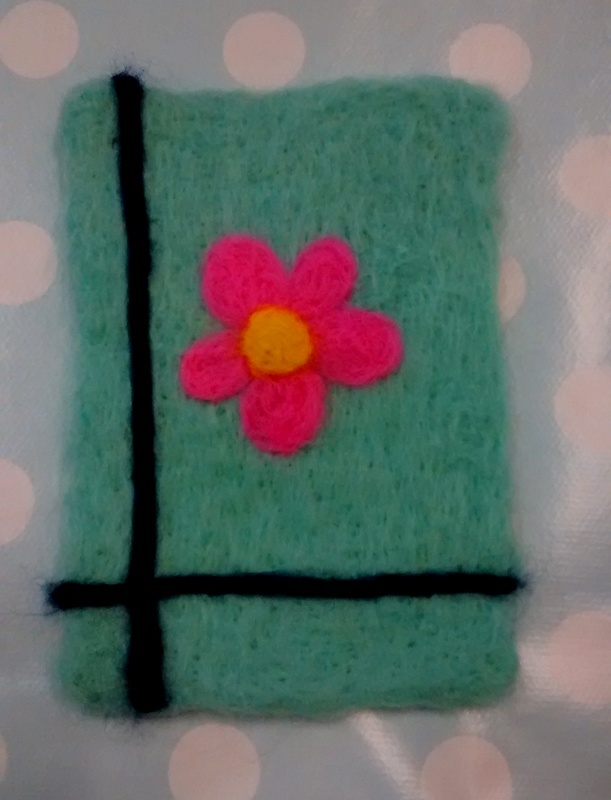 I think it looks great and love how versatile and fluid the creative process can be with needle felting. You’d think by now that it would be time to go home as the workshop was only 2 1/2 hours however it wasn’t. 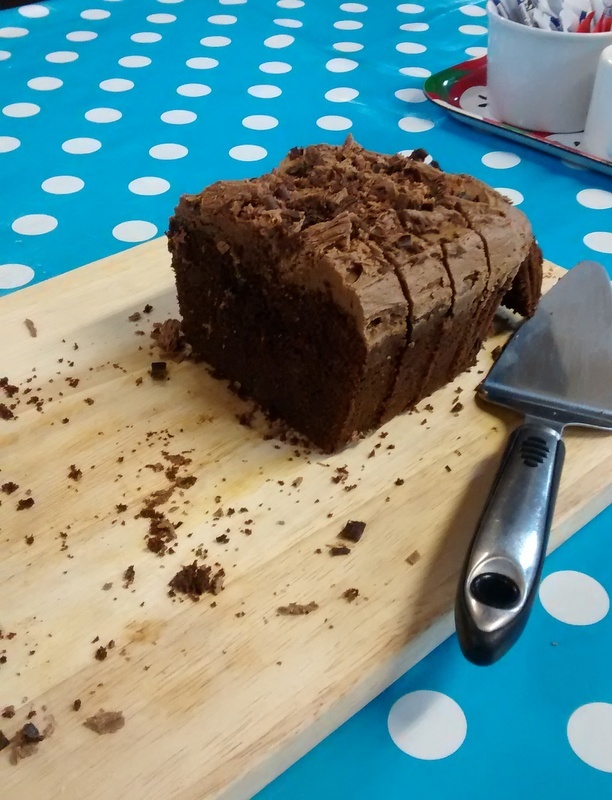 It was time for a cup of tea and slice of very yummy chocolate cake in Karen’s Kitchen. 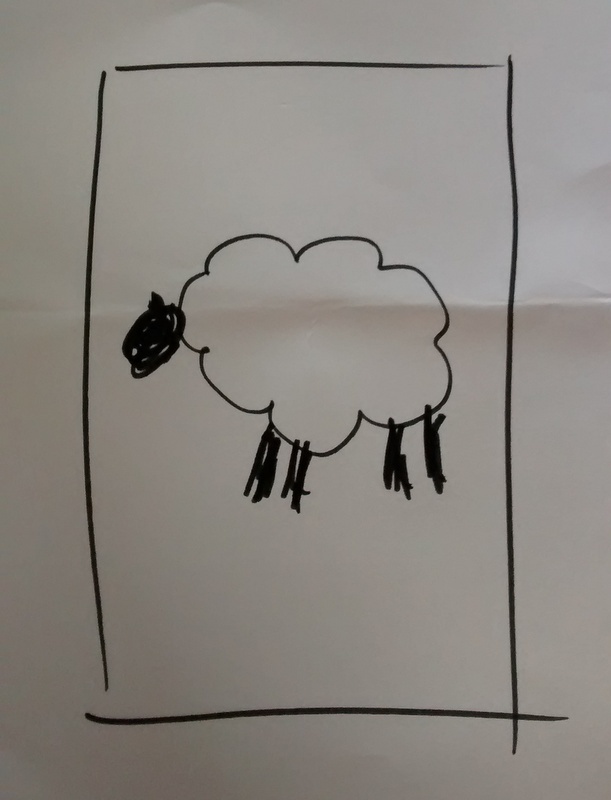 You wouldn’t believe that my two sisters are very accomplished artists would you? It really did pass me by lol! Anyway this is what I ended up with and was actually very close to the picture I had in my head. Thanks 🙂 I’ll be honest, I’m not creative enough to created beautiful picture like Pippa does, but it will be useful for some of my crochet projects. thanks for sharing your experience. 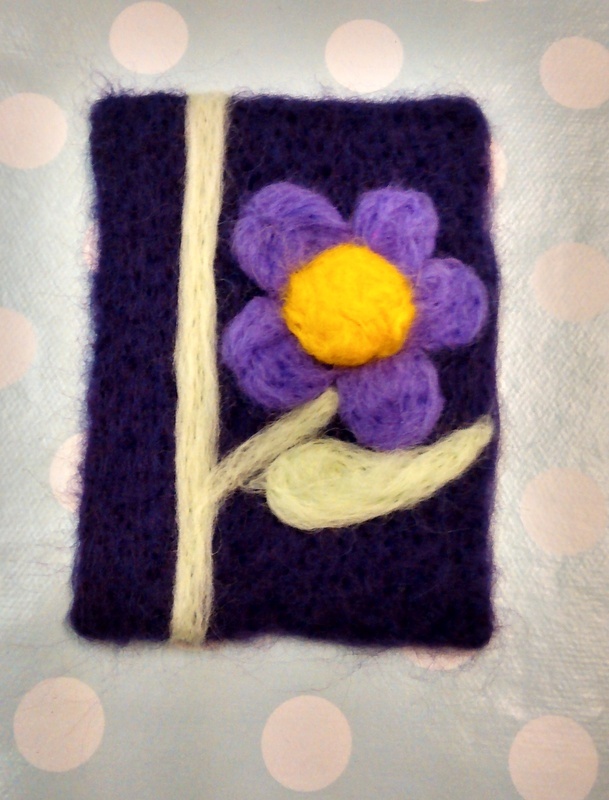 i wanting for so long learning neddle felting but haven’t got chance yet. love to see the crafts, very neat handmade. You should find a local course and do it, it’s very therapeutic!